On 14 May 2015, the Representative for Children and Youth (RCY) submitted her report titled "Paige's Story Abuse, Indifference and A Young Life Discarded" (the Report) to the Legislative Assembly of British Columbia. The Report discussed the life of a 19-year old Aboriginal girl Paige who died of drug overdose in Vancouver on 24 April 2013. Paige was functionally blind and first came into the care of the Ministry of Children and Family Development (MCFD) [or its predecessor the Ministry of Social Servicesaccording to "People, Politics, and Child Welfare in British Columbia" by Leslie T. Foser and Brian Wharf, UBC Press page 146 that had the child protection mandate] when she was 3-month old. The cause of removal from her mother was addictions, violence and neglect. Despite MCFD had 30 child protection reports, Paige continued to be left in the care of her mother. By the time she was 16, she was moved 40 times in different foster homes. In the final three years of her life, she moved another 50 times, all around Vancouver's downtown eastside, one of the harshest neighborhoods in the country populated by drug dealers, addicts and prostitutes. She went to 16 different schools. Her aunt and uncle had offered to take care of Paige but their offer was turned down due to their poor financial standing. Details of her short life are documented in the Chronology of the Report (from page 11 to 35) and will not be reiterated here. The atrocities that Paige suffered under ineffectual and counter productive government interventions are typical in her community after residential schools were created and implemented in Canada. Children are the most valuable and vulnerable assets of a nation. Rulers, tyrants and hegemony have repeatedly used children for political purposes. Children often become tools for exploitation and financial gains. Physical custody and strong influence on children's thought and value (the subversive "Occupy Central" in Hong Kong is an example of the latter) are vital to maintain power and dominance. Under guns and oppressive law of the ruling regime, Aboriginal families had no choice but reluctantly complied with the inhumane demand of giving up their children to be brought up as the regime saw fit. 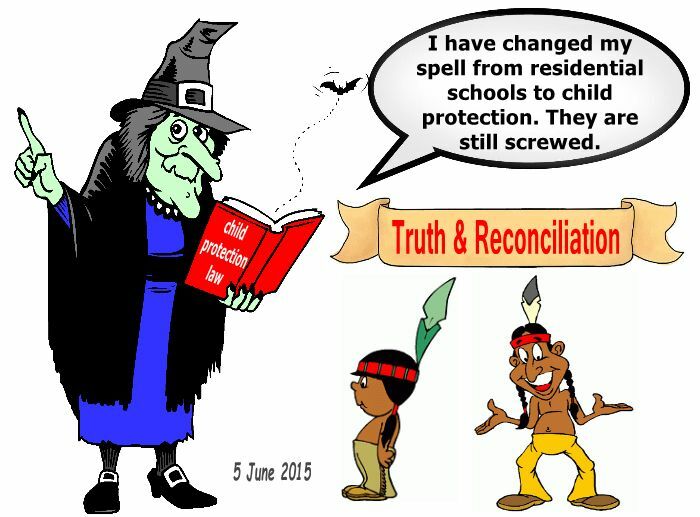 Hypocritical child welfare policy and laws are a blatant affront to family integrity, dignity and Aboriginal rights. After Aboriginal children lost the loving care of their parents and their cultural heritage, most were traumatized in white men run residential schools. Some were neglected, abused or killed. They lost their languages and are now using Anglo-Saxon last names. When they reached adulthood, they had no job skills that enable them to earn gainful employment. Without the proper guidance and teaching of fit parents, many were driven to despair and became addicted to alcohol and drugs with their handout money from various government welfare programs. Despite residential schools are now abolished (the last residential school was shut down in 1996), the aftermath of this oppressive cultural assimilation regime is still haunting many Aboriginal families and Canadians as a nation. It costs taxpayers dearly in financing expensive amending social programs, paying reparation and court awarded damages to the First Nation. Extremely high salaries are paid to Native chiefs, hence turning them into silent lapdogs. Residential schools had effectively reduced the Aboriginals from a sovereign power to an artificially marginalized minority group preoccupied with poverty, substance addiction and hopelessness. The ruse of using children to destroy Aboriginal sovereignty is common in many English-speaking nations with a colonial background. The Australian government did more or less the same to the Australian Aboriginals known as the Stolen Generation. Child protection laws are similar and political ruses (including official apologies) are copycat of one another. Despite the Harper government had renounced residential schools and apologized on 11 June 2008, government has never given up general child removal authority per child protection statute. In the post residential school era, child removal authority has been decentralized from the federal government to the provincial government. This absolute power is the real cause that renders residential schools possible. Such oppressive power could be used against any individuals or group of people. There are compelling reasons to believe that residential schools have re-emerged as child protection, except that all ethnic groups are now at risk. Similarities between residential schools and its sugar-coated derivative modern child protection can be found from our "MCFD & The First Nation" page. According to the statistical data in Table 9.2 of Chapter 9 in People, Politics, and Child Welfare in British Columbia (Leslie T. Foster and Brian Wharf, UBC Press, 2007), 66.3 Aboriginal children (per 1,000 children) under 19 were in the care of the B.C. government versus 6.2 non-Aboriginal children as of 31 March 2003. This suggests that a Native family stands a chance of removal 10.69 times higher than a non-Native family on a per capita basis. This exceptionally high representation is consistent with the findings of the 2006 B.C. Budget commentary from a Vancouver accounting firm using data from 1999 to 2001. High Aboriginal children removal rate is also consistently found in other Canadian provinces and territories. Few Canadians are aware that the federal government subsidizes the removal of Aboriginal children on a per head basis. Aboriginal children are high value targets and are used as a tool to get transfer payment to improve provincial budget and economy. It may appear reasonable to decline adoption offer from relatives who lack the financial means to support the child. However, offering financial assistance to relatives who are willing to adopt is likely a better option for the child and probably cheaper than placing the child in expensive foster care. Note that foster homes are not a free service. Many foster parents are warehousing foster children to earn a tax-free income to support their lifestyle. We do not see how MCFD could justify the decision of refusing adoption of Paige by her aunt and uncle if their weak financial background was the only reason. On another note, some social assistance programs are only available to foster parents, not biological parents. The death of Samantha Martin, who died of heart attack in December 2006, five months after being removed from foster care, is a typical example of atrocities resulted from such an absurd policy. The Report indicated that MCFD repeatedly returned Paige to the care of her unfit mother. This pattern of continually returning and letting her mom to control the situation, as opposed to intervening and protecting her or placing her with willing family members who would have raised her, is identified as a contributing factor to the failure of protection. On the surface, permanent removal appears to be justified. However, Paige's chaotic life and death are most likely an inevitable outcome of the Canadian policy of "killing the Indian in the child", a hidden doctrine of the now renounced residential school system. We leave this as food for thought to our readers to decide the impacts of child removal on families and children. This is a very common practice after children are removed. Despite law (CFCSA in B.C.) requires that the best interests of a child are of paramount importance, removed children are often moved from foster home to foster home. Child protection workers have the discretion to determine where to place removed children. We find this incomprehensible how moving children around frequently could create a stable living environment. Child protection workers seldom provide explanation why foster children are frequently moved. This practice meets little reprimand from court once child protection workers say the magic words "lack of resources". There are many hidden reasons of moving removed children around. Our "Foster Home and Child Removal" page sheds some insight on this issue. Paige died of drug overdose shortly after she reached age 19. When she was under age 19 (the age limit of child protection in B.C. ), she was in the care of MCFD. Page 5 of the Report stated that Paige experienced severe and prolonged maltreatment including alcoholism, drug abuse, smoking, suicide and certain chronic diseases. The main reason of removing her from her unfit mother is to protect her from the aforesaid maltreatments. She obviously suffered all these while she was in care. This defeats the purpose of removing her from her mother. What has child removal accomplished? Furthermore, street drugs are expensive. How did Paige find money to finance her addiction while in care? If she obtained money from unorthodox means (like theft or prostitution) or used her pocket money given by MCFD (or more precisely our tax dollars), child protection workers in charge of her file and her foster parents ought to have monitored her spending and taken steps to prevent the overdose atrocity. Either way, child removal fails its original intent of child protection. From page 63 to page 67 of the Report, the RCY suggested six recommendations. All recommendations require more tax fundings to various service providers in the child protection industry. This supports our view that the pseudo watchdog is indeed beating the same drum to urge spending more tax dollars on the racket. In view of the mountains of empirical evidence that child removal harms more than helps vulnerable children in most cases, the RCY should at least conduct a research on whether foster homes are known safe place as most judges allege. Of course, we doubt whether the RCY will contemplate an endeavor that could potentially collapse the child protection industry. Furthermore, in the second paragraph of page 5 of the Report, Paige was treated with what the RCY described as professional indifference. We all know that professional services are expensive. Professional indifference can be rectified rapidly by providing more financial incentives. This is a subtle way to suggest more access to taxpayer's deep pocket. It is safe to contend that the only certain beneficiaries in the industry are service providers. This official critic appears to be critical, asks embarrassing questions at times and even takes MCFD to court if it fails to provide information sought. Creation of the RCY is a brilliant political decision. If atrocities arise and unwanted public attention is drawn, politicians could use the creation of RCY as a defense of ensuring accountability and transparency. The Albertan Progressive Conservative (PC) government had used this political ruse in 2013 after concealing the actual number of foster children deaths put the government in hot water. Of course, this did not save the 44-year ruling PC party from being voted out of office by Albertan voters angry with endless reports of corruption, self-serving political floor crossings and failure to meaningfully reform child protection policy. By uncovering some defects and certain failures in the child protection industry, the RCY often makes recommendations that require more government fundings. It therefore serves the best interests of service providers in the child protection industry. At the point of writing, the Truth and Reconciliation Commission of Canada finalized its nearly six-year examination of Canada’s residential-schools history resulted in calls for sweeping reforms to government policy and a conclusion that the system amounted to “cultural genocide.” Prime Minister Stephen Harper took part in the closing ceremony for the Truth and Reconciliation Commission, but did not say a word. Aboriginal children are still being separated from their families in foster homes instead of residential schools. Service providers are motivated by financial incentives and job security to target Aboriginal families. There is really no reconciliation without revoking general child removal authority. We are not suggesting that there is no child abuse. Some more serious cases require interventions. But the number of real child abuse is not large enough to justify such a huge bureaucracy and industry comprises of various service providers. Our Criminal Code and Mental Health Act have already given authorities the power to remove children based on good evidence and due process of law. Child protection statute that empowers child removal based on bureaucratic opinion is redundant, counter productive and dangerous. The current modus operandi opens government to corruption and racketeering. It seriously jeopardizes our safety, freedom and liberty. Above all, it is destroying the backbone of a nation: children and families. Most Canadians are not aware how vulnerable they are until it is too late. Act before your loved ones fall prey.